You’ve most likely heard about the new movie, Unbroken, based on the true-life story of Louis Zamperini. What you may not know is that his story is not only one of survival, but of forgiveness. Louis said that hatred does more damage to the one who hates than anyone else. It is a disease that will destroy relationships. Mr. Zamperini was ill-treated and brutally beaten for two long years. Yet, when he got home he realized that he needed to let go of the past in order to embrace the future. This “letting go” required him to travel back to Japan to tell his former captors that he had forgiven them for what they had done. His forgiveness wasn’t dependent on their apology. I don’t know if they ever admitted wrong to him, but he knew it was necessary for him to forgive. I’ve heard it said that if we’ve been wrongly treated and the person hasn’t come to us to ask our forgiveness, our responsibility is to get to the place where if they did ask, we would be able to forgive them. We must posture our hearts to forgive, and in so doing it releases us from the damaging effects of harboring bitterness and hatred in our hearts. I realize that during the Christmas season there are many families who deal with issues that are difficult to face. If there is unforgiveness it is nearly impossible to ignore. It screams in your mind of all the reasons you are justified in how you feel. But these thoughts hurt no one as much as they hurt you. Hatred and bitterness paralyze, which in essence prevents you from moving on with your life. Louis passed away this year at the age of 97. He believed God kept him alive so that he could see his story told by both author (Laura Hillenbrand) and director (Anglina Jolie). His life impacted theirs forever. And their lives impacted his. Forgiveness has a way of spreading healing to all who encounter it. In 2015, let’s purpose to walk in forgiveness. It’s a choice, and if Louis Zamperini can forgive the horrific prison guards who so violated him, certainly there’s a place for forgiveness in our hearts towards those who have wronged us. NOTE: If you are in a physically abusive relationship, we are in no way condoning an acceptance of this at all! We encourage you to seek refuge and help. Finally, I invite you to take a few minutes and listen to this excellent interview where Mr. Zamperini tells his story. It’s heart-warming and inspiring. Great motivation for the start of this new year. This entry was posted in Christian Marriage, Conflict, Forgiveness, Growing Strong Marriages and tagged Angelina Jolie, Forgiveness, Louis Zamperini, Unbroken. Bookmark the permalink. 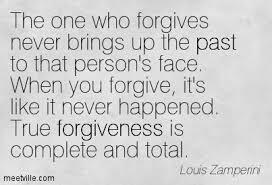 Forgiveness is interesting, to put it mildly. It’s something that can easily slip away when we try to hold it close. 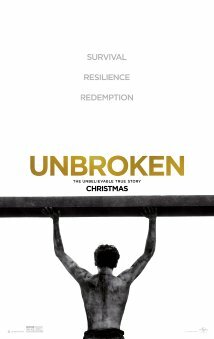 Louis Zamperini’s experiences, and his ability to rise above them and forgive, are a wonderful testimony to the resilience of the spirit, and the value of understanding those aspects of one’s own soul. But I think that many of us can’t really get there. and I wonder if a faux-forgiveness that we may be tempted to assume is really just conceit, like identifying with Jesus because we wear a robe and sandals. There are people in my past I have not forgiven. I suppose I’d like to; they can no longer harm me. But the effects of their actions live on, and given the chance I would throw them under the bus without remorse. And then there are the things I have witnessed, which were done to others. It’s easy in comparison to forgive a personal abuse; but when you see a pile of kids killed because their parents lived in the wrong village and went to the wong church…that, you don’t forgive. You hunt, and live by the motto I’ve seen on motivational posters…”Vengeance is mine, sayeth the Lord…but He subcontracts”. Forgiveness, under the circumstances, seems a betrayal of the murdered innocents. And lack of forgiveness, animated in the harsh judgement meted out to the perpetrators, has the salutary effect of prevention…”our l’encouragement les autres”. Some folks just rate being toe-tagged, and to shrink from that seems to reflect a moral decorousness that places one’s own conscience on a higher plane than the very real agonies around us. But I am fully aware that I may be wrong. Hard topic, and I am glad we have men like Zamperini to hold up a light in this savage darkness. You bring up some good points. We turn to the Bible to guide us through such difficult topics. Its our source and light in the darkness. When Peter asked Jesus how often are we to forgive thise who sin against us He said an unbelievable number–70 times 7. How is this possible? Especially when you say innocents have been affected. With us its impossible, but God can enable us to forgive. We dont know what sins you’ve endured and why its difficult to forgive, but we cant help but wonder if in allowing God to help you forgive, if those effects might diminish. The pain might remain, but the sting would be gone. Thank you for your thought-provoking comment.